With four owners from new, this 1957 Thunderbird twin has a documented distance covered of over 100,000 miles. And it’s still a joy to ride. 59 Club in Paddington in 1968. Brando’s bike was his own slightly customised 1950 Thunderbird, but if you happen to see his life-size image in Madame Tussauds waxworks, you will see he is stood next to a later 1957 model, a similar bike that we have lined up for this month’s road test. This T-bird belongs to Dorset enthusiast Ron Axon – a man who has now been riding for over 70 years – and with more than 100,000 miles on the clock it’s a bike that has seen plenty of action from the day it rolled out the showrooms of Moors in Parkstone (near Poole, Dorset, on the south coast) six decades ago. Ron is only the third owner of the big Triumph and thanks to the late Ray Honeybun – who owned it from 1962 to 2003 – all of the work and servicing has been itemised in a well-thumbed logbook. But before I don my riding suit, helmet and gloves – you will be pleased to hear I’m not going to be dressed like Brando with his long sideburns, Perfecto style jacket, denim jeans and tilted cap – Ron told me a little about some of the bike’s history and the previous three T-birds he has owned. 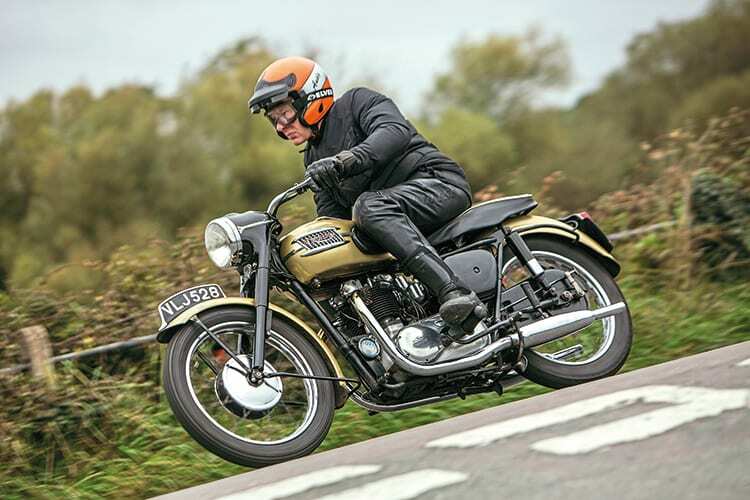 “From my first bike – a 250cc BSA Blue Star in 1946 – I’ve owned all sorts of both British and Japanese machines but I’ve always had a soft spot for Triumph twins and VLJ 528 is my fourth Thunderbird. The first was a 1953 sprung hub model, followed two years later by an early swinging arm bike – finished in blue – and number three in 1956 was a brand-new machine which cost me £253 on the road, including numberplates. Mr Honeybun was obviously an enthusiastic rider and in those first six months he covered just over 4000 miles on the big twin. A new SU carburettor was fitted with 12,000 showing on the clock and the Shell 10/30w oil was changed regularly at 2000 mile intervals, including one on Christmas Eve. Other than regular servicing – including a couple of decokes – the bike reached 23,000 miles before any major work had to be done. This saw an engine strip with replacement main and big end bearings, primary and drive chains and new spindle and bushes in the swinging arm. Another 12,000 miles saw the engine stripped again with a new cylinder block, pistons and valve guides; the same operation repeated in May 1975, September 1978 and January 1981, the latter which also included new clutch plates. The book indicates that at 98,000 the cylinder block, pistons and oil pump were changed once more but this would be the last major work carried out on VLJ 528 before it was bought by Ron Axon in May 2001. 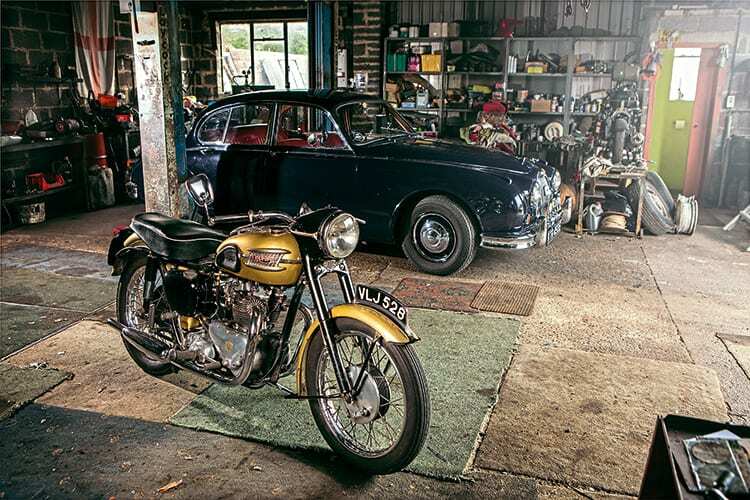 Since then, Ron has used the Triumph on several Westland club runs where the unrestored Thunderbird – with its wonderful patina of gold paint, dents and scrapes – always creates a lot of interest. Many enthusiasts regard the mid-1950s T-bird – a model which, in its first incarnation, would appear in Triumph’s range for 17 years – as one of the best ‘cooking twins’ to emerge from the Meriden production lines, so before we fire Ron’s bike into action perhaps we should reflect a little on the launch of the first Thunderbird back in 1950. To meet the demand from the Stateside market for more horsepower from the 500cc Speed Twin engine, the concept of the name ‘Thunderbird’ and its bigger 650cc displacement was thought up by managing director Edward Turner on one of his regular trips to America. The standard 6T Thunderbird was launched publicly at Montlhery autodrome near Paris in September 1949 where three standard-production bikes were ridden by a team of riders who between them averaged a speed of 92mph over a distance of 500 miles around the steeply banked circuit. This was of great importance to Triumph as their achievement not only made the BBC evening news but also the national dailies and on their return to the UK the three bikes and their riders were cheered into Coventry by a huge crowd. In anticipation of their success at Montlhery, Triumph had sent out publicity packs to both the ‘Blue Un’ and ‘Green Un’ and already had 2500 of their new bikes finished on their production lines. Most of these were destined for the huge USA market to help pay off the massive debts the UK had incurred during the Second World War and they were not to be disappointed as the T-bird was an immediate hit with the Stateside enthusiasts. Not only were they impressed by its torquey 650cc single carburettor engine but also by its evocative name, one which had its origins in native American mythology and spotted by Turner on a motel signboard as he drove to Daytona earlier that year. Other than the fitting of an SU carb in 1952 – this gave excellent fuel consumption – the sprung hub 6T continued pretty much unaltered through to 1955 when the first swinging arm model of the bike appeared. By now it had been surpassed in the sales and performance stakes by the latest twin carb T110 but the Thunderbird, with its ‘paper dart’ logo embossed on the primary chaincase and eye-catching new colours, was still much loved by both sidecar riders and also by the Metropolitan Police.